KPMG remodelled its proposition on digital transformation following a programme of research into the needs and expectations of decision-makers for whom it is a priority. That audience included IT decision-makers, but the campaign was also extended to reach other line-of-business leaders, including those working in marketing, HR, operations and finance. Using multiple channels maximised the chances of the audience seeing and engaging with the key messages. Digital media, such as email, targeted banners, programmatic and social media, allowed KPMG to pinpoint specific targets and then glean valuable insight into their preferences and priorities. Meanwhile, offline channels, from Financial Times cover takeovers to taxis, amplified the campaign and enhanced its impact and credibility. The campaign developed by twogether smashed every target set, generating £35 million – more than 10 times the revenue target of £3.2 million – and contributed to a 70% year-on-year revenue uplift for the proposition. It also moved KPMG from fourth place to first for brand awareness in the consulting market for 2017. KPMG is one of the ‘Big Four’ accountancy/consultancy firms. It operates as a global network of independent member firms offering audit, tax and advisory services in 154 countries and territories. Clients include corporations, governments, public sector agencies and not-for-profit organisations. The firm is recognised by analysts such as Forrester, HFS and IDC for the strength of its digital proposition, but a global brand tracking study showed that it ranked below average for technology and digital transformation among the other ‘Big Four’ competitors: EY, Deloitte and PwC. This campaign was conceived to correct that misconception and establish sustainable momentum for KPMG as a firm that is anticipating the future benefits of technology. KPMG research revealed integrated offerings are important in technology advisory. In response, KPMG brought its digital offerings in cloud, data and analytics, and artificial intelligence together for the first time as a single proposition. The new positioning enabled the firm to move away from its focus on individual technology offerings, demonstrating that it could draw on an integrated range of digital solutions. A multichannel campaign was the most effective way to reach a saturated market. Personalisation and geotargeting were used for the digital elements, with guerrilla targeting for the offline media. This combined approach enabled KPMG to pinpoint individual, high potential clients with great accuracy, generating record results. Improvement of brand awareness in the consulting market from fourth place. 18,000 visits to the campaign webpage. 300 leads from medium-sized businesses to multinational corporates. £3.2m in revenue, achieving a ROI of 400%. The campaign was aimed at medium-sized businesses through to global corporates. As well as targeting traditional buyers of technology, KPMG identified ‘transformation buyers’, including chiefs of finance, HR, operations and marketing. The strategy also capitalised on KPMG’s existing reputation among these audiences as a trusted accountancy brand. Tier one – digital transformation: The overarching Changing Futures messaging. Tier two – value through technology: Connecting digital transformation with disruption and industry issues. Tier three – client stories: Building credentials and showcasing KPMG’s capabilities in digital transformation. Premium digital and outdoor locations helped to establish the campaign’s credibility and maximise exposure. Takeover of the Financial Times website, coinciding with the triggering of Brexit Article 50 in March 2018, when FT readership was expected to peak. Takeover of the Interactive Investor website. 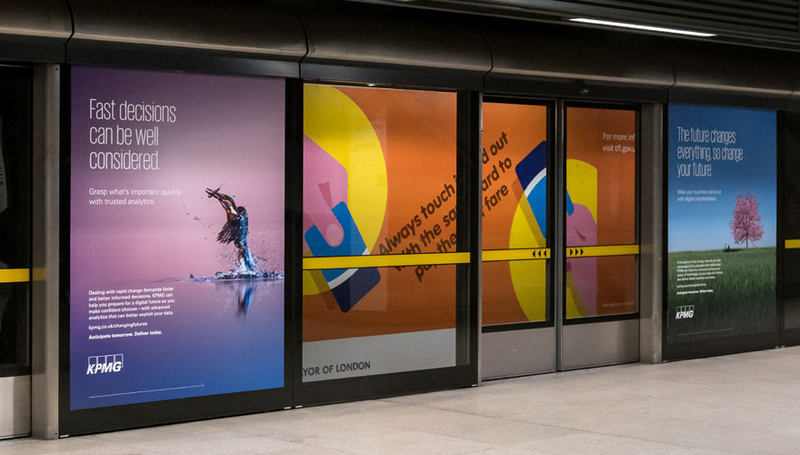 Advertising on underground platforms at Canary Wharf, through which 40% of KPMG UK’s clients typically travel. 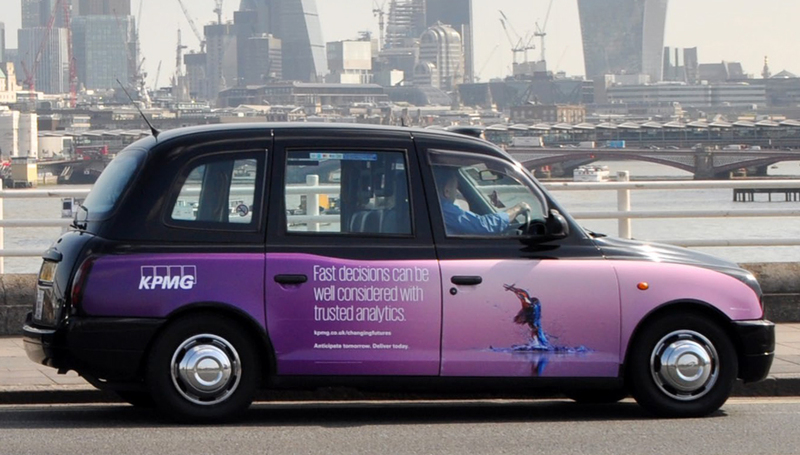 Branding of 100 London taxis, to increase visibility within the Square Mile. Use of guerrilla taxi tactics, including sending taxis to competitors’ sponsored events. Programmatic marketing, with ads appearing across 54 sites aligned with audience demographics; IP tracking was used to eliminate audiences falling outside the target profile. Geotargeted digital advertising allowed the weighting of digital advertising in line with the HQs of specific businesses, including seven companies KPMG had tenders with. Email marketing to existing and target clients, segmented by buyer role and/or sector with messaging tailored accordingly. Webinars and events, including guest presentations and case studies presented by some of KPMG’s biggest accounts and alliance partners. Paid and organic social activity delivered 2.8 million impressions; posts which complemented the outdoor advertising had engagement three times higher than target KPIs and average KPMG campaign engagements, setting new business records. The internal communications programme included all staff communications, webinars for sales teams and competitions via social media to win a ride home in a KPMG taxi. The website was redesigned to present immersive content based on sector, role type and technology. The case studies emphasised different aspects of digital transformation and different audience profiles, proving that KPMG had already successfully delivered for businesses like theirs. Pre-launch – Proposition development based on outputs from the market study. Phase one (build reputation) – March to June 2017. Phase two (drive engagement) – April to September 2017. Phase three (deliver leads) – Commenced in May, ran to the end of September. An average digital media CTR of 0.2%, double the industry benchmark of 0.1% (Source: Encore Digital Media). 22,095 website views from non-KPMG users, from 17,855 unique visitors, exceeding the 18,000 target by 23%; approximately treble the number of visitors received by other KPMG campaign webpages. Average site dwell time of 2.94 minutes, approx. 30% higher than KPMG UK’s average. 2,468 client company engagements, including KPMG’s top five clients, and 840 marketing leads (180% over target). Of these, more than 330 are sales accepted leads, with meetings secured with several significant new potential clients, including Pizza Hut and Schroeder's. £35 million worth of new business influenced by the campaign. Placed first for UK consulting brand awareness in 2017. A 70% year-on-year uplift in revenue for the propositions. A 5,284% ROMI based on a £650,000 spend. This submission won the award for Best multichannel campaign at the B2B Marketing Awards 2018. 'Changing futures' for KPMG by twogether.